Concealed carry has become a daily fact of life for literally millions of Americans. Unsurprisingly, this has caused the tools and techniques of discreet firepower- once the exotica of undercover cops and James Bond novels- to become completely mainstream. So today, the quest for the “perfect” holster is no longer limited to the professionals: workaday folks- of every size, shape, and description- are in the hunt, too. And as expected, the industry is responding. You and I have concealed carry options available to us that would amaze the James Bonds of just a few years ago. 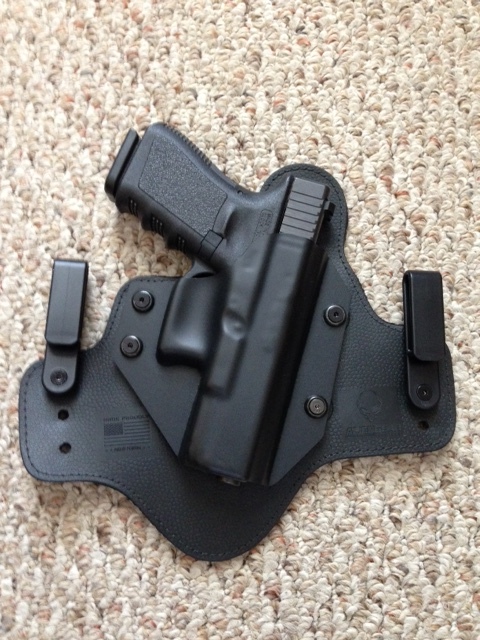 One of the most popular of these recent developments is the so-called “hybrid” holster. First popularized by the Missouri-based Cross Breed Holster company, a hybrid rig cleverly combines (hence “hybrid”) the best features of several different holster types, resulting in a comfortable, easy-to-carry package. 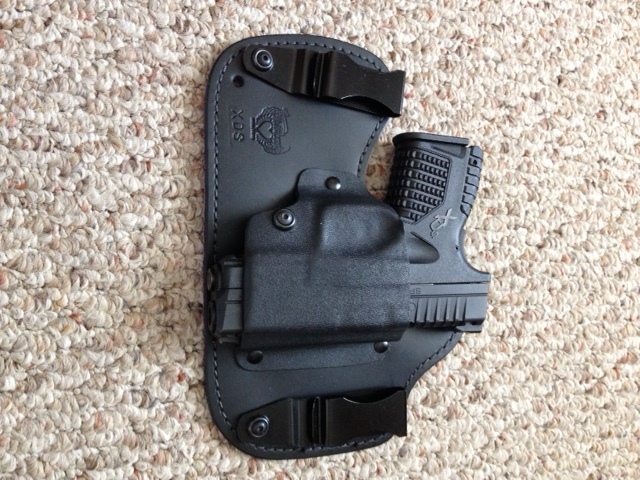 Typically, a hybrid design will have a wide, flat and flexible leather or synthetic panel, to which is affixed a kydex or polymer holster “shell.” This shell is closely molded to secure a specific handgun model. The advantages to this design are apparent: the wide panel is flexible enough to conform to the wearer’s body. This not only minimizes uncomfortable friction spots, but it distributes the weight of the gun over a wider area, lessening the perceived burden. The holster shell fits the contours of the pistol precisely enough to make additional retention straps or mechanisms unnecessary. 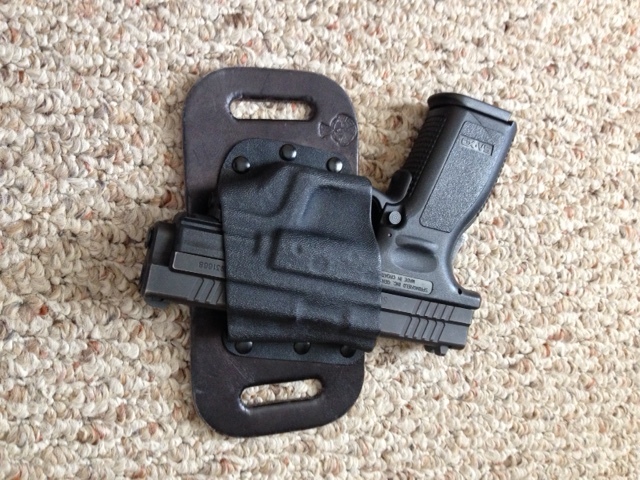 Almost unheard of in the past, this basic platform works just as well on outside-the-waistband (OWB) belt holsters as it does on the more common inside-the-waistband (IWB) rigs! As ideas go, it’s a pretty dang good one! As we well know, imitation is the sincerest form of flattery. So as the success of the hybrid design rocketed Cross Breed from virtual obscurity to premier maker almost overnight, many others jumped in- looking to both capitalize on and improve upon, the hybrid concept. While there are many hybrids on the market, we will highlight a few that not only demonstrate the ingenuity and innovation of today’s holster makers, but with which we have direct experience and can recommend as quality choices worthy of your personal consideration. Let’s start with an early favorite, a genuine Cross Breed. Featuring a one-piece Kydex sheet holster shell flat-riveted to a handcrafted horsehide panel, the Cross Breed is still the standard by which all others are judged. The example illustrated is an OWB rig that despite its compact dimensions, comfortably hauls a full-size Springfield Armory XD 9mm pistol with a Crimson Trace Laser Guard attached! Next up, an example of how widespread and how mainstream the hybrid design has become. This rig comes not from a holster maker directly from a gun manufacturer- the legendary house of Beretta! The Italian gun maker is not only known for their excellent firearms, but also for offering high-quality Beretta-labeled shooting accessories to compliment the guns. The hybrid holster shown fits the Beretta BU9 Nano pistol and features a breathable, thoroughly perforated synthetic panel. One the plus side, this certainly keeps the holster comfortable. And while the perforations may rob the panel of some of its weight-bearing stiffness- the Nano is a pretty lightweight pistol anyway- no worries. Moving on, we find one of the best-kept secrets in the holster business today: a well-designed, well-built hybrid IWB holster from Flash Bang Holsters. Yes, you read that correctly: Flash Bang! You mean the folks who make that little bra holster? That’s right! Despite what you may have heard or thought, Flash Bang offers a wide variety of concealed carry gear…for both men and women! Who knew! Lastly, let’s look at what, in my opinion, may very well be the best of the breed in hybrid holsters- the innovative “Cloak Tuck 3.0” from Alien Gear Holsters. This Idaho-based company took the hybrid concept and ran with it, first hitting the market with their original “Cloak Tuck” IWB. This holster introduced several immensely appealing features: a padded neoprene panel for outstanding comfort, a panel that was pre-drilled…with all hardware supplied…so that the owner could change the angle and height of the gun at will. Or even change the gun! Alien Gear’s design allows the owner to remove the holster shell and replace it with a different shell for a different gun (after all, we gun types are a fickle lot)! Not enough for you? Alien Gear offers free trades for life- send back the shell for the gun that you used to carry and they’ll swap it out for a shell that fits your new gun. And all of this at a price point below that of much of the competition. While price shouldn’t be the determining factor, it sometimes is, anyway. Rest assured that with Alien Gear, you’re not sacrificing quality. Which brings us to their latest, the “Cloak Tuck 3.0”- along with all of the above mentioned, this latest edition features a thinner panel, covered in a synthetic material they coyly call “alien skin.” It is thin, durable, flexible and ideal for the surface of a holster. 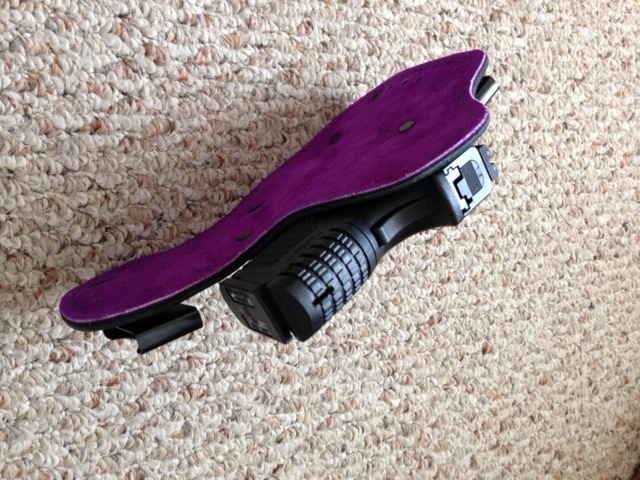 The new 3.0 panel also offers greater support for the holster shell. How? There is a paper-thin piece of spring steel sandwiched into the “alien skin” panel. The end product is thin, lightweight, and comfortable, with excellent stability and retention. And with a simple allen wrench I can switch from a Beretta 92FS to a Glock 43 and back again! So despite the fact that I could spend more, I don’t think that I can buy more. As stated earlier, Mid-Ohio IMB has used every product mentioned here and can confidently recommend them to anyone in the market for quality concealed carry gear. There are many good hybrid holsters available from a diverse group of manufacturers. As always, we encourage you to do your own homework and choose what’s best for you. 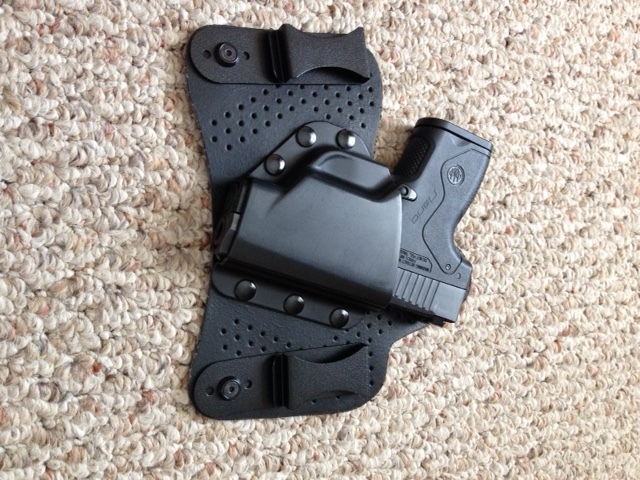 Stealthgear USA ONYX is by far the best hybrid holster myself and many others have discovered! Couldn’t stand the Alien Gear after trying Stealthgear product. Plus, the Stealthgear won a award for 2014 SHOT Show Ladies Choice Award. It’s great there are so many options. Glad you found one you like.